Polyhydramnios usually means that there is an increased amount of amniotic fluid present (oligohydramnios means that there is not enough amniotic fluid). Amniotic fluid is fluid surrounding the fetus inside the uterus during pregnancy. The amount of amniotic fluid is usually determined by fetal urination and fetal swallowing, so anything that impairs either of these can impact the amniotic fluid. The amniotic fluid increases until about 34 weeks and then slightly decreases toward the due date. How is the amount of amniotic fluid determined? either the deepest vertical pocket (DVP) or the amniotic fluid index (AFI). In multiple gestations, the DVP is used. What is the deepest vertical pocket (DVP)? The DVP is a measurement of the deepest vertical pocket of amniotic fluid. I is reported in centimeters. When the single DVP is used, polyhydramnios is defined as a measurement ≥ 8.0 cm. What is the amniotic fluid index (AFI)? A reliable method of determining the amount of amniotic fluid is the Amniotic Fluid Index (AFI) and many doctors will do this test first in order to make the right diagnosis. At 32 weeks, for example, the normal AFI is between 86 mm and 242 mm. When AFI is used, the threshold for the upper normal is generally considered to be 24 cm or 25 cm, depending on whether a 95th or 97th percentile is selected. What are the degrees of polyhydramnios? The degree of polyhydramnios is frequently categorized as mild, moderate, or severe, based on an AFI of 24.0 to 29.9 cm, 30.0 to 34.9 cm, and ≥ 35 cm, or a DVP of 8 to 11 cm, 12 to 15 cm, or ≥ 16 cm, respectively. Mild polyhydramnios accounts for approximately 65% to 70% of cases, moderate polyhydramnios for 20%, and severe polyhydramnios for < 15%. What are the possible causes of polyhydramnios? When polyhydramnios is found, your doctor usually does some additional tests to see if a cause can be found. When an etiology of polyhydramnios is identified, it is most commonly a fetal anomaly or maternal diabetes. Other potential causes of apparently isolated polyhydramnios in a structurally normal fetus include alloimmunization and congenital infection. In over 60% of cases of polyhydramnios, the cause is not found (idiopathic). Overproduction of fetal urine due to a high-output cardiac state, renal abnormality, or osmotic fetal diuresis. In general, any anomaly severe enough to cause nonimmune hydrops fetalis (NIHF) may result in polyhydramnios, as these entities are often associated with each other. With maternal diabetes, maternal hyperglycemia leads to fetal hyperglycemia, with subsequent osmotic diuresis into the amniotic fluid compartment. Alloimmunization can lead to fetal anemia with resultant NIHF and polyhydramnios. Congenital infections, such as parvovirus, cytomegalovirus, or syphilis, can lead to polyhydramnios by a variety of mechanisms, including anemia or cardiac dysfunction. What evaluation should be performed when polyhydramnios is detected? Idiopathic polyhydramnios is a diagnosis of exclusion. While the cause may be unexplained during pregnancy, the underlying risk that a structural or genetic abnormality is identified after birth in a pregnancy associated with apparently idiopathic polyhydramnios is 9% in the neonatal period to as high as 28% when infants were followed up to age 1 year. Initial evaluation for polyhydramnios involves targeted ultrasonography to assess for fetal abnormalities. 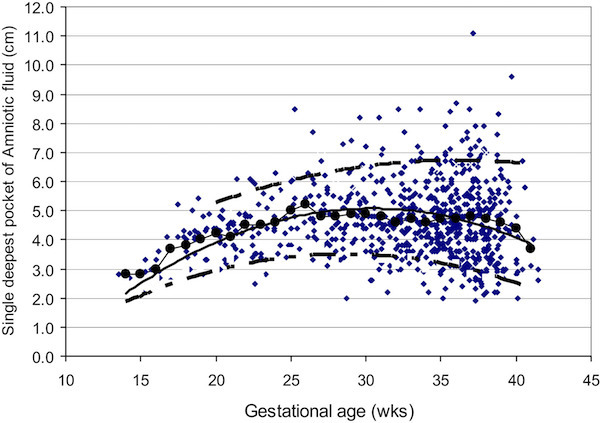 It is important to assess fetal growth because idiopathic polyhydramnios may be associated with macrosomia, and fetal growth restriction associated with polyhydramnios presents a high risk for an underlying fetal abnormality, including trisomy 13 or 18. Not all of the abnormalities associated with polyhydramnios are detectable by ultrasound. Fetal esophageal atresia and tracheoesophageal fistula are among the most common polyhydramnios-associated abnormalities and may be difficult to diagnose by ultrasound. Disorders associated with apparently isolated polyhydramnios also include genetic syndromes for which there may be no sonographic findings or no screening or diagnostic test available. Diabetes, alloimmunization, and congenital infection should be considered in a structurally normal fetus with mild polyhydramnios. Routine prenatal care includes screening for diabetes and alloimmunization, as well as testing for syphilis. Congenital infection usually presents with additional sonographic findings, such as NIHF, hepatomegaly, splenomegaly, or placentomegaly. In cases of polyhydramnios associated with NIHF or additional sonographic features, evaluation for fetal anemia and congenital infection is recommended. Severe polyhydramnios presenting earlier in gestation should raise a greater concern for an underlying etiology. In severe cases, especially early in gestation, it is important to review the medical and family history, in addition to obtaining a detailed ultrasound examination. Genetic counseling and consideration of testing for neurologic disorders such as congenital myotonic dystrophy should be considered, especially with decreased fetal movement. How is a pregnancy with polyhydramnios managed? Polyhydramnios severe enough to cause maternal respiratory compromise, significant discomfort, or preterm labor often has an underlying etiology, whereas idiopathic polyhydramnios, because it is usually mild and does not present until the mid-third trimester, does not typically require treatment. In selected cases, however, amnioreduction may be considered in an effort to relieve maternal dyspnea or discomfort. Overall, in cases of severe polyhydramnios that results in maternal respiratory compromise such that amnioreduction is considered, an underlying fetal abnormality is usually present. In addition, polyhydramnios usually recurs after amnioreduction, making its efficacy somewhat limited. Indomethacin, which is often used for tocolysis, decreases fetal urine production. Due to reported neonatal complications, and in the absence of data on improved maternal or neonatal outcomes, we recommend that indomethacin not be used for the sole purpose of decreasing amniotic fluid in the setting of polyhydramnios. The likelihood of an underlying fetal abnormality is significantly higher with greater degrees of polyhydramnios, and progression of the condition is suggestive of an underlying etiology. In pregnancies with an identified underlying etiology, the degree of polyhydramnios is associated with an increased likelihood of preterm birth (PTB), a small-for-gestational age infant, macrosomia, and perinatal mortality. Rates of PTB are not generally increased with idiopathic polyhydramnios (which is usually mild) but PTB is associated with more severe polyhydramnios. Reported data on whether perinatal mortality is increased with idiopathic polyhydramnios have been inconsistent. Idiopathic polyhydramnios is associated with infant birthweight > 4000 g in approximately 15% to 30% of cases. The most recent guidance from the American College of Obstetricians and Gynecologists on antepartum fetal surveillance does not specifically address isolated polyhydramnios or list it as an indication for surveillance. Although antepartum surveillance is often performed in this setting, there are no data to suggest that such assessment decreases perinatal mortality. The role and frequency of follow-up ultrasonography is unclear, but the imaging may be warranted in cases where there is concern for progression of polyhydramnios or to evaluate fetal growth. Regarding timing of delivery, there are no data to suggest that induction of labor or PTB are associated with an improved outcome in the setting of mild idiopathic polyhydramnios. Labor should be allowed to occur spontaneously at term and the mode of delivery should be determined based on usual obstetric indications. If an induction is planned, it should not occur at < 39 weeks’ gestation in the absence of other indications. Rates of fetal nonvertex presentation are reported to increase as severity of polyhydramnios increases. Clinical or sonographic determination of the fetal presenting part should be performed upon presentation in labor. External version for nonvertex fetal presentation may be considered if there are no contraindications to this procedure. Rates of dysfunctional labor are increased in the presence of polyhydramnios. Studies have also demonstrated that women with pregnancies complicated by idiopathic polyhydramnios are significantly more likely to undergo a cesarean delivery for failure to progress. Rates of caesarean delivery for women with pregnancies complicated by idiopathic polyhydramnios range from 35% to 55%. An increased risk of operative vaginal delivery in the presence of polyhydramnios has also been reported. Some investigators report a higher frequency of nonreassuring fetal heart rate tracings and postpartum hemorrhage. Planning for care of the neonate is necessary in cases of polyhydramnios. 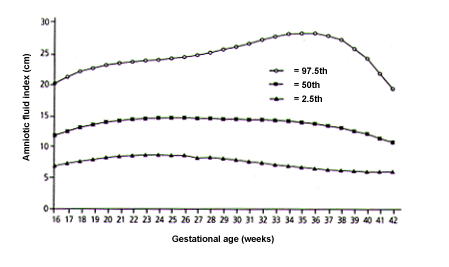 As noted previously, there is an increased rate of structural abnormalities or genetic syndromes in the neonate following a gestation complicated by polyhydramnios. Idiopathic polyhydramnios has also been associated with an increased risk of neonatal intensive care unit admission. Pediatric support should be available at delivery for women with mild, idiopathic polyhydramnios; for women with severe polyhydramnios, delivery at a tertiary center is recommended.